Stephen F. Austin State University alumnus K.C. Rudy of Wildlife on the Move gives Kayla Handy a closer look at a bearded dragon during his presentation to Little STEM Jacks. Through the program, students ages 7 to 11 participated in three days of immersive scientific discovery, learning about wound care, robotics and ecology. 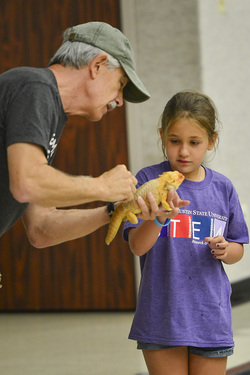 NACOGDOCHES, Texas - Nacogdoches resident Kayla Handy was one of 65 participants in Stephen F. Austin State University's Little STEM Jacks camp who got a closer look at a bearded dragon. Through the program, students ages 7 to 11 participated in three days of immersive scientific discovery, learning about wound care, robotics and ecology. The week concluded with the live-animal presentation by Wildlife on the Move, led by SFA alumnus K.C. Rudy. "The success of the program can be primarily attributed to the collaboration among several faculty in the College of Sciences and Mathematics, area teachers and the STEM Research and Learning Center," said Dr. Jana Redfield, assistant director of the center. In addition to the Little STEM Jacks camp, the center offers programs throughout the year for elementary through high school students. For more information about the STEM Research and Learning Center, visit stem.sfasu.edu.